Banned Books Week is September 25-October 1. 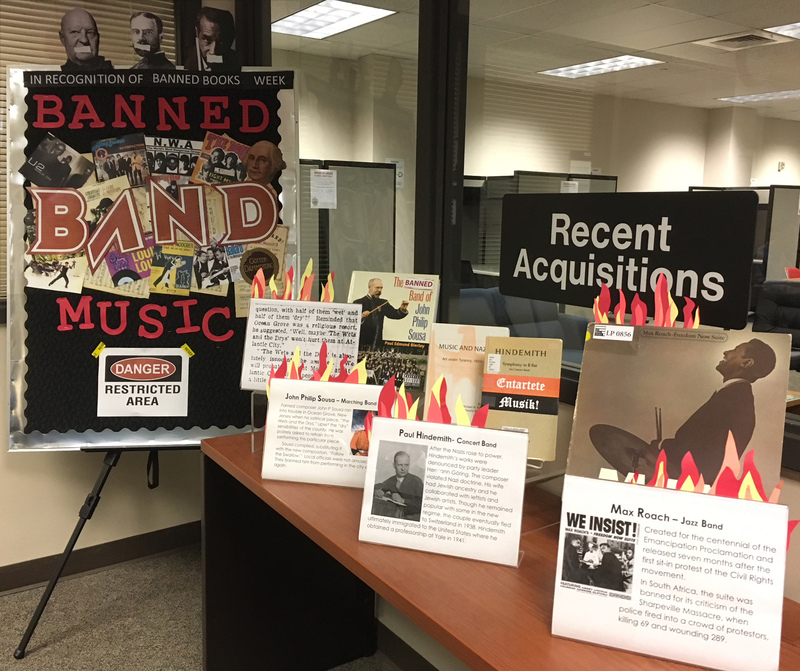 During that time, come check out our Banned Music exhibit and see music-related items from our library that were banned throughout history. This year, our exhibit focuses on Banned Band Music. Get it? Our exhibit focuses on 3 examples of censored band music. The first is Max Roach’s jazz band album, We Insist- Freedom Now Suite. Filled with political activism, it was banned in South Africa for its criticism of a government-led massacre. The next work is Paul Hindemith’s concert band piece, Symphony in B Flat. This work was banned by the Nazi regime during its crusade against so-called degenerate art. The third censored work is John Philip Sousa’s The Wets and the Drys. This satirical piece imagines an interaction between 2 groups of tee-totalers and drinkers. A dry county in New Jersey was not amused by Sousa’s plan to perform this piece. Our exhibit is part of a nationwide event, Banned Books Week, which annually celebrates the freedom to seek and express ideas, even those considered unorthodox or unpopular. For more information, check out http://www.bannedbooksweek.org/.